If you are remotely attached to or like to keep up-to-date with the world of solar or aeronautics, there is a good chance you would have heard the name of Solar Impulse. Just to refresh memories, Solar Impulse is a Long Range (LR) solar-powered aircraft project with the aim to demonstrate the extraordinary capability of completing a circumnavigation of the earth using a fixed wing plane powered only by solar cells and therefore bringing glory to the name of renewable and solar energy in particular. As the name suggests, the Solar Impulse 1 was the first to be built and was a demonstration aircraft capable of flying for about 36 hours. It was a monoplane and flew for the first time in a test flight in December 2009. The Solar Impulse project is piloted expertly by the Swiss Engineer André Borschberg and a Swiss psychiatrist Bertrand Piccard. They had initiated the project all the way back in 2003 and by the time the aircraft took flight, the Solar Impulse team comprised of 50 engineers, 100 advisers and about 80 partners. As most projects of this scale, the project is part funded by the Swiss Government and part by private firms such as ABB, Schindler, etc. to name a few. The wingspan of the Solar Impulse 1 was about 63.4 meters with a maximum takeoff weight of 4,400 lb. The aircraft is capable of a cruise speed of 70 kmph with a service ceiling of 8,500m. The first international flight of the Solar Impulse 1 was on May 13, 2011 when the aircraft flew from Switzerland to Brussels in Belgium in 13 hours. In command of the aircraft was André Borschberg at a cruising speed of 50kmph. In comparison to this, a cross-Atlantic flight taken by a Boeing 777 cruises at a speed of about 1000kmph at a service altitude of about 35,000 feet with a positive tailwind. The slow cruising speed of the aircraft meant that it was declared unfit to fly in adverse flight conditions and air traffic had to be routed around the slow moving machine, were among the other challenges it faced. Despite this the aircraft completed its first intercontinental flight in 2012 and then went on to cross the United States in 2013. 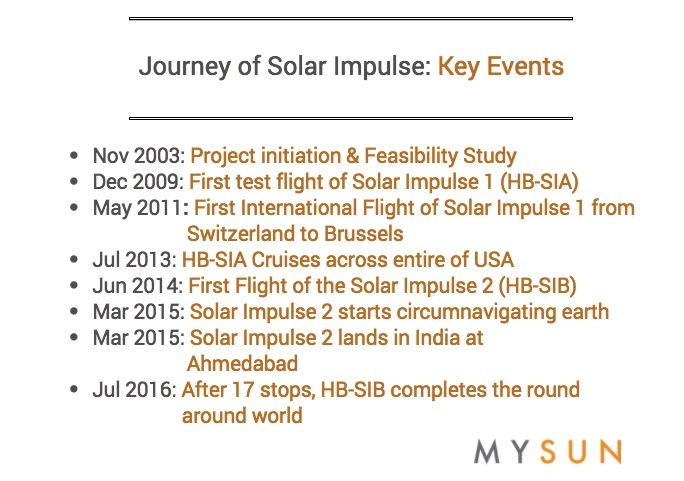 Solar Impulse 2 registered as HB-SIB is the successor to the Impulse 2 and took its first flight on June 2, 2014 from the Payerne Air Base. The aircraft featured a larger wingspan at 71.9 meter and a faster cruise speed of 90kmph. The service ceiling of the plane though was same as that of the Impulse 1 at 8,500m. Being a more powerful aircraft than the Solar Impulse 1, the HB-SIB started the circumnavigation around the earth on March 9, 2015. The program was delayed by about 3 years due to a structural failure. The journey around the world began from Abu Dhabi. The Solar Impulse flew primarily in the Northern Hemisphere with 12 planned stops, closely monitored by a control center established in Monaco. The aircraft flew day and night, usually slower at night to conserve power and with pilots alternating between the stops. Poor weather conditions over Pacific and issues with batteries meant that the aircraft took 17 stages to complete the round around the world. It landed in Abu Dhabi back on July 26, 2016. In the process, the Solar Impulse 2 set several records such as being the first fixed wing-solar powered manned aircraft to circumnavigate the earth. It's flight from Japan to Hawaii lasting 117 hours, 52 minutes covering a distance of 7212km is the longest solar-powered flight, by time and distance. Next challenge up for the Solar Impulse team is to develop an unmanned solar power aircraft and contribute to the fields of communication, observation and surveillance. It is expected the first test flight will be ready by the year 2019. MYSUN’s take: One of the founders of the program, Swiss psychiatrist Bertrand Piccard rightly mentioned that “Our goal is to create a revolution in the minds of people...to promote solar energies – not necessarily a revolution in aviation." At MYSUN we strongly believe that by powering an aircraft that is capable of going around the planet, the project very aptly demonstrates the power of solar. We have already seen spacecraft and satellites using solar cells for power so there is little doubting on the capability of solar. With the cost of building a solar system coming down and government giving the right push, it is clear that solar will emerge as a primary source of power capable of combatting the acute power shortage that our country faces. It is therefore, a matter of when rather than if solar will go mainstream. Audience like you can play a vital role by becoming a solar ambassador and sharing such unique and powerful applications of solar and motivating your friends, colleagues and family members to take action. So make sure to use the share buttons and bring the right awareness around and motivate those you know to start their solar journey.